Walk into an appeals court hearing involving the Federal Energy Regulatory Commission and you'll probably see Robert Solomon sitting at the counsel's table on one side. Solomon is FERC's solicitor, responsible for defending the agency against a nonstop stream of lawsuits from energy companies, landowners, environmentalists and others affected by the commission's decisions. 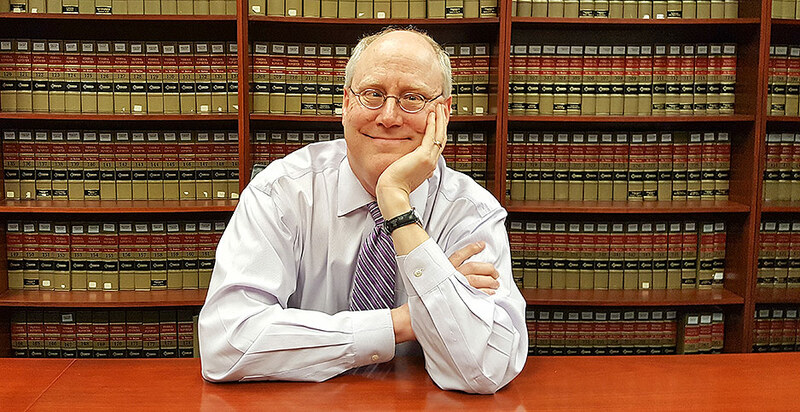 As the agency's top litigator, Solomon, 57, often appears before judges to argue FERC's side, and he's involved in every legal brief the commission files. He's been particularly busy lately, helping his team prepare for three to five oral arguments in different cases each month since September — with topics ranging from pipeline approvals to hydropower projects to electric grid regulation. In the Solicitor's Office — a branch of the Office of the General Counsel — Solomon oversees 14 litigation staffers and 11 others focused on rehearing requests the commission receives. There's a lot to juggle, but the Washington, D.C.-area native jokes that he may be "genetically predisposed" for the job. His father was Richard Solomon, general counsel of FERC's predecessor, the Federal Power Commission, in the 1960s. Robert Solomon swears he didn't spend his childhood "transfixed by stories of energy regulation," but the field drew him in nevertheless. After earning his law degree from the Washington University School of Law in St. Louis, he briefly worked in private practice and then joined FERC in 1988. Alas, Solomon's three children opted not to carry on the energy law tradition. But he laughs proudly when he recalls his son doing an elementary school project 20 years ago on FERC Order No. 888, which required open access of transmission lines. "While all of the other students were writing about sports or entertainment or whatever, he did his report on FERC's Order 888 rulemaking," he said. Solomon sat down for an interview last week in the solicitor's library at FERC headquarters in Washington. The room doubles as the team's "moot court" base, where just 30 minutes earlier, Solomon was busy refining arguments with his staff for yet another upcoming case. You've been here since 1988 and solicitor since 2005. How much has the agency changed through the years? It has changed a lot, both the work of the commission and the litigation practice concerning the commission. The most obvious difference is that decisions of the courts or pleadings that we file are now immediately available to the outside world. Back in the day, when I first came here, when I first joined the Solicitor's Office in the late 1980s, the decision could issue, and it could be days before anybody even knew about it. The decisions, if they were from outside the [U.S. Court of Appeals for the District of Columbia Circuit], they would be mailed to us. So we had plenty of time to prep and spin and control how we wished the decision to be interpreted. I used to tell people that I'm an energy lawyer, I work for the FERC. Back in the day, that would be a conversation stopper. Nobody would know what to say. Maybe they would feign interest, but they really weren't interested. In all seriousness, you tell people that you work for the FERC or you tell people that you're an energy lawyer and I defend the agency before the courts of appeals, and a lot of people truly are interested now in what we do, and they know about our agency and what we're doing. Now the decisions come out, and everybody knows about them immediately. I feel like it's important for me to be the first person to inform my client, the commissioners, as to the importance of any decision. But unless I'm right in front of my terminal at that particular moment, the commissioners might know about the decision long before I've ever been able to even start taking a look at the opinion. And obviously the issues before the FERC are different, and I think they're much more interesting now. I don't want to malign the commission of decades past, but decades past, of course, the issues were more utility-specific and involved cost-of-service ratemaking issues, how to calculate the growth rate in the discounted cash flow methodology for determining return on equity — good stuff, good stuff! — but fortunately, we have fewer of those cases. The cases nowadays are less utility-specific than they used to be and are more generically applicable. And this is a good thing. The issues are much more interesting and much more generally understood now that the issues are more generic in nature. Does one area interest you more than others? I've been happy with the evolution of the case law and the work. I don't necessarily want such a concentration of one particular area at one particular time, and while I enjoy the pipeline cases in particular — they raise [National Environmental Policy Act] and environmental issues of the type that are truly fascinating — I don't want to be inundated with too many of those at one time. Of course that's the staffing issue right now. The litigation office, I only have 10 litigation attorneys, and I'm always concerned if we're particularly awash at any one particular time with cases requiring immediate turnarounds or deadlines. My wish and hope is that I have a relatively steady stream of cases so that I can effectively staff those cases. My concern is when we have a heavy uptick in volume and when we have a particularly high number of arguments or briefs or emergency motions to attend to at any one particular time. We always manage. I worry about staffing all of the cases because we have to staff for heavy periods of litigation, but we manage. We meet all deadlines, and I think everything that we file is of superior quality. Do you see that volume decreasing as legal questions get answered? I hope someday for the volume to be reduced, but I don't foresee any such reduction anytime soon. Again, this isn't necessarily a bad thing. The issues that my agency handles are profoundly important and vital and very much oriented toward the public interest, and the parties before the commission can have different perspectives and views on where the public interest balance lies. It's not remarkable to me that we have a particularly high number of cases right now, and I don't begrudge any litigant any case that they file because I certainly understand that if you have a legal right to file and if you're aggrieved by a FERC decision, you should have appropriate redress to the courts. And we do our best to defend the commission. Your father was Richard Solomon, general counsel of FERC's predecessor, the Federal Power Commission, in the 1960s. What is it like to be from a FERC family? Did you discuss the commission at the dinner table? I'm very proud of my father, and I'm very excited when people recognize the connection between me and him. He was general counsel of the commission from 1962 to 1969. He was appointed in the Kennedy administration and served throughout the Johnson administration. And then he was a senior prominent member of the energy bar until his retirement in the late '80s. People just assume that I've been raised since birth to be a FERC lawyer or the FERC solicitor, and they assume that I would go to bed each night listening to stories of the Permian Basin Area Rate Cases [a 1968 Supreme Court case], or at dinner I would be transfixed by stories of energy regulation. But as you might imagine, I thought these issues were obtuse and dare I say boring. I did not think that this is where I would end up, but I guess it's hard to break the genetic code, and I guess I am genetically predisposed to do this. When I came to the commission in 1988, there were still plenty of people here at the commission and in the energy bar who had practiced with my dad, either with him or against him in various cases, so I would hear stories about him several times a day, and, alas, it's now 2018, and very few people bring up the connection at all. Unfortunately, my dad's no longer alive. He died right before I got the solicitor job, and a number of people wrote cards to me saying, "Congratulations, your dad would be very proud of you." That's particularly meaningful to me. What would he think about how the work of the agency has evolved and how your work has evolved? Of course, he was very proud of the commission back in the 1960s. At that time, the biggest issue was the Northeastern blackout of 1965. I think he would be amazed by how the agency has changed, how the issues of importance have changed. He would be amazed by public interest in what the commission does. As a practical matter, as the FERC solicitor in charge of defending the agency before the courts, things would probably be a lot easier if we were what we used to be — a rather sleepy, unheard-of agency. The prominence of the agency and the issues we attend to make it more likely that whatever we do will be appealed or that there will be litigation in one form or another. The past year has raised several unique issues for the commission, including several months without a quorum, a rulemaking proposal from the Department of Energy and a pipeline certificate remand from the D.C. Circuit. What's that been like? It's not unusual for us to have a particularly high-profile case or two or three at any one particular time. We had a stretch two or three years ago when we had a trilogy of cases that went all the way up to the Supreme Court on federal-state pre-emption and statutory issues. That was a particularly difficult and high-profile time, so to the extent we have other particularly high-profile cases, we always have something. If it's not pre-emption or a pipeline, it will be enforcement cases. There are always a couple of high-profile matters, but 80 percent of what we do might not be so high-profile, but they might be just as important to the agency or for precedential purposes. You teach an energy law seminar at American University's Washington College of Law. How do you feel about our next generation of energy lawyers? I'm excited about the next generation of energy lawyers. People want to do this. Lawyers want to practice at the FERC, as well as they should. Because the issues are profoundly important, we get the opportunity to practice with the highest caliber of lawyers in the energy bar and the appellate bar. I also want to simply say how fortunate I am in having a client in the commission, both as a collegial institutional body and as individual commissioners. The commissioners are all a dedicated, civic-minded, public-interest-minded group of individuals, and I'm very proud to represent them. I've done this for years now, but it's a thrill for me to stand up before a court — I was just in the 11th Circuit last week — to stand up and introduce myself and say, "I represent the Federal Energy Regulatory Commission." It really is an awesome responsibility to represent the FERC, to represent the federal government, and it really is an awesome honor and privilege to be able to represent the agency before the highest courts available. What else do you share with your students about working for FERC? University students, law students, they really are interested in energy and environmental law. If you're interested in practicing environmental law, there's really no area of law or public policy that is better-suited to practicing environmental law or dealing with environmental issues. This is particularly true with the project cases. We create more NEPA law than any other agency or department. When it comes to indirect effects or cumulative impacts or project segmentation or environmental justice, these are all issues that we're dealing with right now. And increasingly, especially on the projects side, we're dealing with cases that involve not just simply the Natural Gas Act or the Federal Power Act, but other statutes that have to be respected in one form or another: the Clean Water Act, Endangered Species Act, Coastal Zone Management Act, National Historic Preservation Act, you get the point. The issues can be more subtle. The commission's been around for 80-plus years, and it amazes me when we're dealing with issues where there is no definitive precedent that governs that particular matter. We'll be amazed, like, "I can't believe in 80 years nobody has addressed this issue," or maybe the issue was addressed 30 years ago, but it doesn't accurately reflect recent amendments to the Federal Power Act or doesn't reflect other developments. How many cases have you argued as solicitor? It's gotten to the point where I've lost track. I think 80 myself since I've been solicitor. I'm on all the briefs. Without wanting to age myself, my first argument was in 862 F2d [a volume of legal opinions] and we're now up to 863 F3d, so my arguments span a thousand volumes. My first argument was AnR Pipeline Co. v. FERC — something about gas — and we lost it. My name's on all of the pleadings, and I feel like it's my responsibility to make sure that the courts receive the highest-quality pleadings that we can. My goal is that the Solicitor's Office be the best small law firm in the city. My goal is also for the Office of General Counsel to be the best medium-sized law firm in the city. We get to match wits with the most prominent law firms and lawyers nationwide, and I want our work product to be just as good, if not better, than anything that is produced by any of those top law firms and lawyers. Most important, I want the judges to know that we are providing high-quality pleadings, but I also want them to know that we'll always be professional and ethical and forthright in any pleading, in any argument we make — because of course we want to win that particular case, but we want to maintain our integrity and respect before the judges who we appear before repeatedly, so it's important to me that the FERC be respected. I met my wife, Nancy, in law school, and I enjoy talking about the legal and energy issues with her. She's much smarter, and she's a much better lawyer [now retired] than I could ever hope to be. She is not an energy lawyer, but she might as well be one at this point because she's heard me talk about the issues so often. This goes back to what we discuss at the table. The issues now are actually dinner-table-type conversations that you can actually have with your wife and with your children. And, true, they might be feigning interest to some extent, but they'll actually come back, and they'll actually talk about the issues or ask why are you doing that or how well was that received. These are issues that people want to talk about now, not just law students, but everybody. How do you spend your time when you're not steeped in the Natural Gas Act and the Federal Power Act? I enjoy reading, I enjoy music, I enjoy being an empty-nester now with my wife. We actually have time now to see movies, or to go out to dinner or to go to museums. My wife, Nancy, and I enjoy hiking, especially long-distance hiking — last year we completed a 150-mile hike across Scotland along the John Muir Way. One thing that thrills me is I try to bike to work as much as possible, and we now have the Metropolitan Branch Trail. The route from where I live in Wheaton, [Md. ], to here used to be somewhat sketchy, but no more. It allows me to feel comfortable when I bike into work and back at night. I do it most days March to November. I work for an energy agency, and I feel I should be conserving energy whenever possible, and I feel like I'm doing my little part when I'm on my bike.